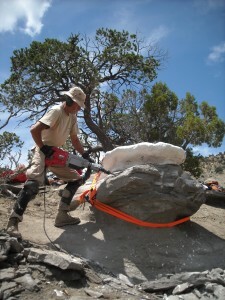 Using a jackhammer to remove rock from the skeleton of “Joe”. Excavation permits from the US Bureau of Land Management (Utah) and Grand Staircase-Escalante National Monument in hand, the crew from the Alf Museum and Webb Schools returned to “Joe’s” resting place in the summer of 2010. The fossil couldn’t simply be yanked out of the ground; it had to be carefully uncovered and protected, inch by inch. The work started by trimming down the rock that contained the skeleton. Fortunately, there was little overburden (covering rock). However, the rock was also quite hard. So, it took a jackhammer to remove the worst of the rock! Before this process started, the bones were carefully swaddled in burlap bandages soaked in plaster (a “jacket”); this would help to hold them together in the face of vibrations from the equipment. After the rock was trimmed down, the skeleton was given a thicker plaster jacket on its top surface. With the top surface protected, the block containing the skeleton was flipped over onto a cushion of loose sand. More excess rock was trimmed away, and then the exposed rock and bone were given a plaster bandage. The skeleton of “Joe” was ready to transport…almost. The find was miles from the nearest road, within steep and treacherous badlands. Furthermore, the jacket containing the skeleton weighed nearly 1,000 pounds! There was no way to haul it out by hand. Swaddling the bones of “Joe” the dinosaur in plaster-soaked burlap bandages.